Almond Roca is one of my ultimate favorites. Some how making it at home doesn’t seem as decadent as buying a big box of it from the store. This is a loved candy at Christmas time but why not have it at any time of the year!! This recipe is from a friend of mine Sonia who graciously allowed me to share it with you all. What a fabulous treat to make for your family or a great gift for a dinner party for the hostess, a wonderful teacher gift, a great birthday treat. 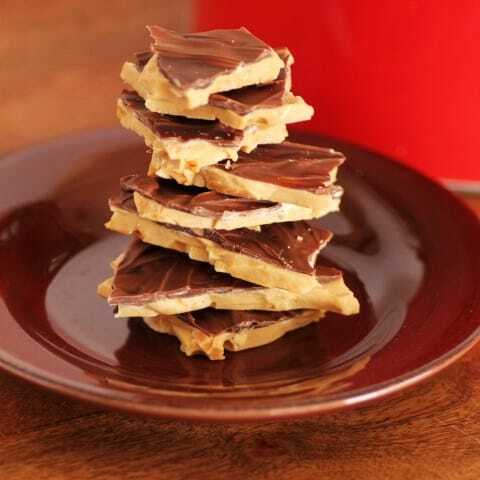 The list goes on and on why you should be making this scrumptious confection!! I hope you all enjoy it as much as we do!! An easy and delicious candy that tastes just like the original. Great recipe! I love Almond Roca’s! I haven’t had one in a long time, maybe I should just make your friends recipe instead! Thank you for sharing! I have to make some again real soon. Thanks for coming over Jennifer! !